Understand the different approaches of WordPress and Squarespace to make the right choice for you. Trying to decide between WordPress and Squarespace, and wondering which is better from a web design perspective? You're not alone. I recently got a question through my blog from someone asking this very question, and I can understand how you may be confused, especially if you're not a professional web designer, or you don't have experience with both platforms. The overall answer is that it depends on what you mean by 'better for design', because they each have a different approach to design. Having used both platforms myself for the last 7 years, I've written this post to help anyone planning to create your website on your own, without the help of a professional designer/developer. Out of the box, WordPress comes with a few standard templates, and they are fairly limited. However, because WordPress is open source software, web designers from anywhere in the world can create their own WordPress templates, called 'themes'. You can buy professional WordPress themes from many different online marketplaces, such as Themeforest, iTheme or dozens of others. You can also find themes for free, though you might get some baked-in ads on free themes. There are thousands of WordPress themes available out there. A theme generally comes with preset layouts and visual embellishments like colours, patterns and graphics included. Many themes have a limited number of colour or font adjustments that non-designers can apply without knowing any code. However, most themes have set dimensions and sizes on elements, such as the theme on my blog that you're reading right now. The bands of colour at the top are a set height, and the width of the sidebar is set, and you can't change these without tinkering with the designer's code. Other elements also tend to be set, too: for example, on this blog's theme, I can't move my logo from the left to the center or right side of the page without digging deep into the code. Furthermore, even an experienced web designer may have trouble tinkering with a theme that was designed by a theme designer, because everyone has a slightly different way of writing code, and this can vary wildly from one WordPress designer to another. And, since there are no agreed standards on the right way to code a WordPress theme, there are lots of sloppily-coded or overly complex themes out there, too. This can make your site load slowly, for example. However, there are some great themes, too. And these days, many of the more expensive themes come with lots of fancy tools such as drag-and-drop page layout makers that mean even non-designers can create attractive page layouts. But: every theme designer approaches these special tools in their own way, so you will have to learn how to use the tools for your specific theme - and if you later switch to a different theme from a different designer, you will lose any custom page layouts made with these bespoke tools. And, if your new theme designer has his/her own special tools, you'll need to learn how to use these tools now, instead. It can get pretty confusing and time-consuming unlearning and then relearning stuff like this. To make it even more complicated, sometimes a theme designer will bundle another designer's tools into his/her theme. This is commonly used for things like slideshows or layout-makers. So, to build your website, you'd have to learn (a) how to use WordPress, and (b) how to customise your theme, and (c) how to use any third-party tools that are bundled with the theme. And of course, all the steps and help guides for all of these things are in different places, written by different people, and in some cases, written by people whose first language isn't English (or non-technical English!). Even if your theme doesn't come bundled with third-party tools, you'll probably need some anyway, as WordPress's standard page layouts are pretty boring: no columns or social media icons or anything like that. You'll need third-party tools to do anything fancy on a page-by-page basis. And those tools (called 'plugins') might be buggy or incompatible with your theme or version of WordPress, because they're all made by different people, and there's no one acting as the guardian of quality. It's a lot like shopping for a new shirt. There are millions of shirts in the world, in loads of different styles. Some are short-sleeved, some are long-sleeved; some are expensive and well-made, some are cheap and might not last very long. You could spend ages searching for the perfect shirt, and you might find one that's pretty close to what you want in a particular shop. If you've been to that shop before, you probably know exactly how to get there, but if you don't, it might take you a while to figure it out. And if the shirt's pretty close to what you want, you might buy it and perhaps change the buttons yourself, or you might get a tailor to make some alterations for a better fit. You'll also need a tie or scarf to go with your new shirt, and unless you are lucky enough to get one bundled with your shirt, you'll need to go to a completely different store to buy one. And, you can never be sure whether these accessories will be good quality - heck, the dye might even bleed onto your new shirt, making it unwearable. WordPress themes are like off-the-rack, ready-to-wear fashion. Someone else has made them, and you're kind of stuck with some things (eg. you'd never be able to make a short-sleeve shirt have long sleeves). If you can find a theme that's really close to what you want, you might be able to do some minor tweaks yourself, but anything more and you might need professional help. You don't need a lot of creative skills, but you might need to spend a lot of time searching for the right theme. Squarespace approaches things in a very different way. Squarespace has around 22 true templates, all of which are available for free with your Squarespace subscription. A template has certain layouts and elements set within it, such as the position of the navigation or whether it has a banner image in the header or not. Unlike WordPress themes, which usually have colours and fonts pre-selected for you, Squarespace takes more of a blank canvas approach. By default, they all have plain white backgrounds and no decoration. Instead of having visual embellishments baked into the template, it's up to you to apply these. The template is just an empty shell framework, like the structural elements of a house. You apply the paint and furnishings. In all templates, you can choose any colour in the world and any of 600+fonts, and you can usually also control the size of elements, too. You can add patterns or background images, and sometimes switch things on or off, such as showing a sidebar or not, and in most themes you can choose where to position your logo, too. You make all of these changes within a single tool: the Squarespace Style Editor. No matter which theme you use, all changes happen here. And all templates are built and supported by Squarespace. When it comes to individual page layouts, you control those within the content editor built right into Squarespace. You use the standard Squarespace tools to make columns, add images, quote boxes or social icons. All of the tools you use are made by Squarespace, and all the help and instructions are located within the Squarespace help pages. If you're comfortable with copying/pasting code, you can extend the capabilities of Squarespace further - but you probably won't need to do this unless you have very specific needs (most of the usual stuff is already catered for within Squarespace). It's a lot like going to a fabric store and choosing a pattern to make your own custom shirt. There are a limited number of patterns in the store, but you can use any fabric you want to use. And, if you have basic sewing skills, you can easily adjust one of the set patterns to customise the sleeves, collar, pockets or other elements. All of the patterns in the store have been made by the same company, so once you learn the individual quirks and methods from one pattern, you can just go back to that store in future, pick up another pattern, and then make another shirt really easily and quickly. Plus, there are quite a few tailors who have shopped at this store for years, so if you need someone to help with your alterations, they'll also be familiar with how the patterns work. And the shop also offers sewing classes, too. The same store also sells its own ties and scarves, guaranteed to be of good quality and not bleed dye onto your new shirt. The choice isn't very wide, but at least you know what you are getting. So, overall you'll need more creative skills to work with Squarespace, but you'll have more fine-tuned control than you would with Wordpress. You'll spend more time fine-tuning your design, but once you learn the ropes, all changes in future will be quick. 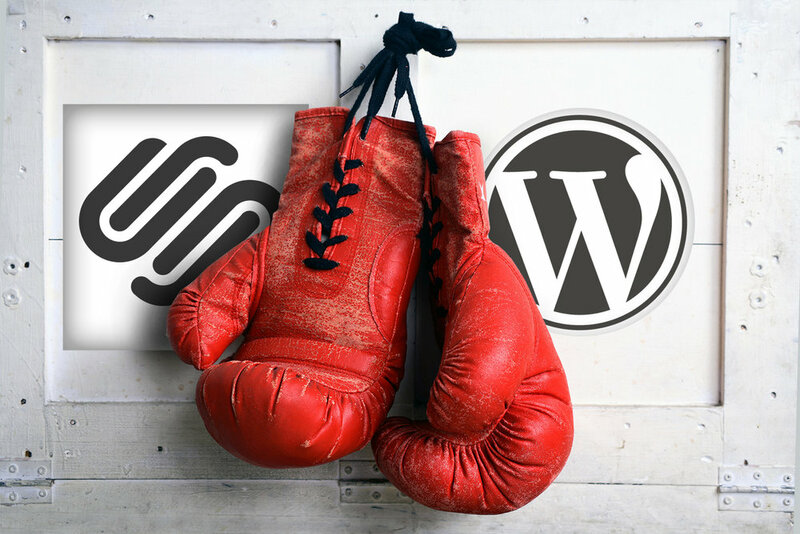 Be sure to check out my Wordpress vs Squarespace comparison, which goes into detail about the overall pros and cons of each platform.